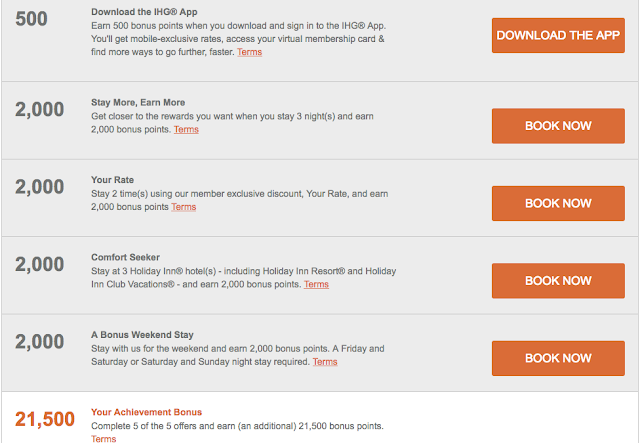 Rewards Canada: IHG Rewards Club Accelerate returns for Q1 2017 - Earn 30,000 or more bonus points for your IHG stays! IHG Rewards Club Accelerate returns for Q1 2017 - Earn 30,000 or more bonus points for your IHG stays! IHG is enjoying their Accelerate promotion so much that it is once again their systemwide offer for the first quarter of 2017. As we have seen each quarter or so they come out with new personalized offers for each member. The total bonus available per member ranges from a minimum of 30,000 points to well past 100,000. This is the baseline offer that any IHG Rewards Club member should receive however many of you will receive more rewarding offers. We actually had no IHG stays in 2016 and it appears the more active you have been in the program the better the offer you'll receive. Let us know in the comments section what offer you received.